English poet, born in the rectory (now rebuilt) of Great Berkhampstead, Hertfordshire, on the 26th of November (Old Style 15th) 1731, his father the Rev. John Cowper being rector of the parish as well as a chaplain to George II. On both the father's and the mother's side he was of ancient lineage. The father could trace his family back to the time of Edward IV when the Cowpers were Sussex landowners, while his mother, Ann, daughter of Roger Donne of Ludham Hall, Norfolk, was of the same race as the poet John Donne, and the family claimed to have Plantagenet blood in its veins. Of more human interest were Cowper's immediate predecessors. His grandfather was that Spencer Cowper who, after being tried for his life on a charge of murder, lived to be a judge of the court of common pleas, while his elder brother became lord chancellor and Earl Cowper, a title which became extinct in 1905. The Rev. John Cowper was twice married. Cowper's mother, to whom the memorable lines were written beginning "Oh that these lips had language", was his first wife. She died in 1737 at the age of thirty-four, when the poet was but six years old, and she is buried in Berkhampstead church. Cowper's stepmother is buried in Bath, and a tablet on the walls of the cathedral commemorates her memory. The father, who appears to have been a conscientious clergyman with no special interest in his sons, died in 1756 and was buried in the Cowper tomb at Panshanger. Only one other of his seven children grew to manhood -- John, who was born in 1737. The poet appears to have attended a dame's school in earliest infancy, but on his mother's death, when he was six years old, he was sent to boarding-school, to a Dr. Pitman at Markyate, a village 6 miles from Berkhampstead. From 1738 to 1741 he was placed in the care of an oculist, as he suffered from inflammation of the eyes. In the latter year he was sent to Westminster school, where he had Warren Hastings, Elijah Impey, Lloyd, Charles Churchill and Colman for schoolfellows. It was at the Markyate school that he suffered the tyranny that he commemorated in Tirocinium. His days at Westminster, Robert Southey thinks, were "probably the happiest in his life", but a boy of nervous temperament is always unhappy at school. At the age of eighteen Cowper entered a solicitor's office in Ely Place, Holborn. Here he had Thurlow, the future lord chancellor, as a fellow-clerk, and it is stated that Thurlow promised to help his less pushful comrade in the days of realized ambition. Three years in Ely Place were rendered happy by frequent visits to his uncle Ashley's house in Southampton Row, where he fell deeply in love with his cousin Theodora Cowper. At twenty-one years of age he took chambers in the Middle Temple, where we first hear of the dejection of spirits that accompanied him periodically through manhood. He was called to the bar in 1754. In 1759 he removed to the Inner Temple and was made a commissioner of bankrupts. His devotion to his cousin, however, was a source of unhappiness. Her father, possibly influenced by Cowper's melancholy tendencies, perhaps possessed by prejudices against the marriage of cousins, interposed, and the lovers were separated -- as it turned out forever. During three years he was a member of the Nonsense Club with his two schoolfellows from Westminster, Churchill and Lloyd, and he wrote sundry verses in magazines and translated two books of Voltaire's Henriade. A crisis occurred in Cowper's life when his cousin Major Cowper nominated him to a clerkship in the House of Lords. It involved a preliminary appearance at the bar of the house. The prospect drove him insane, and he attempted suicide; he purchased poison, he placed a penknife at his heart, but hesitated to apply either measure of self-destruction. He has told, in dramatic manner, of his more desperate endeavor to hang himself with a garter. Here he all but succeeded. His friends were informed, and he was sent to a private lunatic asylum at St. Albans, where he remained for eighteen months under the charge of Dr. Nathaniel Cotton, the author of Visions. Upon his recovery he removed to Huntingdon in order to be near his brother John, who was a fellow of St. Benet's College, Cambridge. John had visited his brother at St. Albans and arranged this. An attempt to secure suitable lodgings nearer to Cambridge had been ineffectual. In June 1765 he reached Huntingdon, and his life here was essentially happy. His illness had broken him off from all his old friends save only his cousin Lady Hesketh, Theodora's sister, but new acquaintances were made, the Unwins being the most valued. This family consisted of Morley Unwin (a clergyman), his wife Mary, and his son (William) and daughter (Susannah). The son struck up a warm friendship which his family shared. Cowper entered the circle as a boarder in November (1765). All went serenely until in July 1767 Morley Unwin was thrown from his horse and killed. A very short time before this event the Unwins had received a visit from the Rev. John Newton, the curate of Obey in Buckinghamshire, with whom they became friends. Newton suggested that the widow and her children with Cowper should take up their abode in Olney. This was achieved in the closing months of 1767. Here Cowper was to reside for nineteen years, and he was to render the town and its neighborhood memorable by his presence and by his poetry. His residence in the Market Place was converted into a Cowper Museum a hundred years after his death, in 1900. Here his life went on its placid course, interrupted only by the death of his brother in 1770, until 1773, when he became again deranged. It can scarcely be doubted that this second attack interrupted the contemplated marriage of Cowper with Mary Unwin, although Southey could find no evidence of the circumstance and Newton was not informed of it. J. C. Bailey brings final evidence of this in The Poems of Cowper. The fact was kept secret in later years in order to spare the feelings of Theodora Cowper, who thought that her cousin had remained as faithful as she had done to their early love. It was not until 1776 that the poet's mind cleared again. 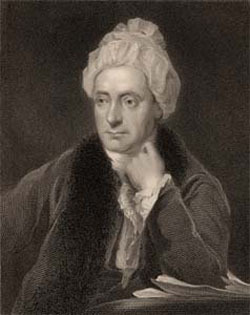 In 1779 he made his first appearance as an author by the Olney Hymns, written in conjunction with Newton, Cowper's verses being indicated by a "C." Mrs Unwin suggested secular verse, and Cowper wrote much, and in 1782 when he was fifty-one years old there appeared Poems of William Cowper of the Inner Temple, Esq. : London, Printed for J. Johnson, No. 72 St Paul's Churchyard. The volume contained "Table Talk", "The Progress of Error", "Truth", "Expostulation" and much else that survives to be read in our day by virtue of the poet's finer work. This finer work was the outcome of his friendship with Lady Austen, a widow who, on a visit to her sister, the wife of the vicar of the neighboring village of Clifton, made the acquaintance of Cowper and Mrs. Unwin. The three became great friends. Lady Austen determined to give up her house in London and to settle in Olney. She suggested The Task and inspired John Gilpin and The Royal George. But in 1784 the friendship was at an end, doubtless through Mrs. Unwin's jealousy of Lady Austen. Cowper's second volume appeared in 1785 -- The Task: A Poem in Six Books. By William Cowper of the Inner Temple, Esq. ; To which are added by the same author An Epistle to Joseph Hill, Esq., Tirocinium or a Review of Schools, and the History of John Gilpin: London, Printed for J. Johnson, No. 72 St. Paul's Church Yard; 1785. His first book had been a failure, one critic even declaring that "Mr. Cowper was certainly a good, pious man, but without one spark of poetic fire." But the second book was an instantaneous success, and indeed marks an epoch in literary history. Before its publication -- in 1784 -- the poet had commenced the translation of Homer. In 1786 his life at Olney was cheered by Lady Hesketh taking up a temporary residence there. The cousins met after an interval of twenty-three years, and Lady Hesketh was to be Cowper's good angel to the end, even though her letters disclose a considerable impatience with Mrs. Unwin. At the end of 1786 a removal was made to Weston Underwood, the neighboring village which Cowper had frequently visited as the guest of his Roman Catholic friends the Throckmortons. This was to be his home for yet another ten years. Here he completed his translation of Homer, materially assisted by Mr. Throckmorton's chaplain Dr. Gregson. There are six more months of insanity to record in 1787. In 1790, a year before the Homer was published, commenced his friendship with his cousin John Johnson, known to all biographers of the poet as "Johnny of Norfolk." Johnson also aspired to be a poet, and visited his cousin armed with a manuscript. Cowper discouraged the poetry, but loved the writer, and the two became great friends. New friends were wanted, for in 1792 Mrs. Unwin had a paralytic stroke, and henceforth she was a hopeless invalid. A new and valued friend of this period was Hayley, famous in his own day as a poet and in history for his association with Romney and Cowper. He was drawn to Cowper by the fact that both were contemplating an edition of Milton, Cowper having received a commission to edit, writing notes and translating the Latin and Italian poems. The work was never completed. In 1794 Cowper was again insane and his lifework was over. In the following year a removal took place into Norfolk under the loving care of John Johnson. Johnson took Cowper and Mary Unwin to North Tuddenham, then to Mundesley, then to Dunham Lodge, near Swaffham, and finally in October 1796 they moved to East Dereham. In December of that year Mrs. Unwin died. Cowper lingered on, dying on the 25th of April 1800. The poet is buried near Mrs. Unwin in East Dereham church. Cowper is among the poets who are epoch-makers. He brought a new spirit into English verse, and redeemed it from the artificiality and the rhetoric of many of his predecessors. With him began the enthusiasm of humanity that was afterwards to become so marked in the poetry of Robert Burns and Percy Bysshe Shelley, William Wordsworth and Lord Byron. With him began the deep sympathy with nature, and love of animal life, which was to characterize so much of later poetry. Although Cowber cannot rank among the world's greatest poets or even among the most distinguished of poets of his own country, his place is a very high one. He had what is a rare quality among English poets, the gift of humor, which was very singularly absent from others who possessed many other of the higher qualities of the intellect. Certain of his poems, moreover -- for example, "To Mary", "The Receipt of my Mother's Portrait", and the ballad "On the Loss of the Royal George", will, it may safely be affirmed, continue to be familiar to each successive generation in a way that pertains to few things in literature. Added to this, one may note Cowper's distinction as a letter writer. He ranks among the half-dozen greatest letter writers in the English language, and he was perhaps the only great letter writer with whom the felicity was due to the power of what he has seen rather than what he has read.